This entry was posted in 1700s, Amy, Buildings, Civil War, Early Settlement, Fredericksburg and tagged Francis Thornton on March 27, 2008 by amyb. 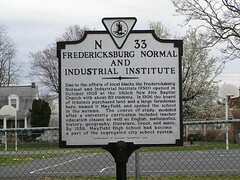 This entry was posted in 1700s, Buildings, Fredericksburg, Jennifer, Location and tagged Alexander Spotswood, Benjamin Franklin, Spotswood's Furnace, William and Mary on March 23, 2008 by jlfeldhaus. This entry was posted in 1800s, Civil War, Fredericksburg, Headquarters/Camps, Whitney and tagged Battle of Fredericksburg, Lee Hill, Lee's position, Telegraph Hill on March 14, 2008 by wholcomb. This entry was posted in 1600s, Early Settlement, Elle, Fredericksburg, Great Lives and tagged Amoroleck, Fredericksburg, Indians, Jamestown, John Smith, Mannahoac, Mosco, Pocahontas, Rappahannock River on February 27, 2008 by eweaver.